Construction sites can be dangerous places. Workers must often deal with occupational hazards such as falling objects, heavy machinery, and working at great heights. It should come as no surprise that the leading cause of death and serious injury in the construction industry is falls, according to the Occupational Health and Safety Administration.Construction workers are prone to falls when working on scaffolding or climbing ladders. Often, these accidents are due to negligence. In fact, OSHA also reports that the number one violation on a construction site is failing to provide adequate fall protection. 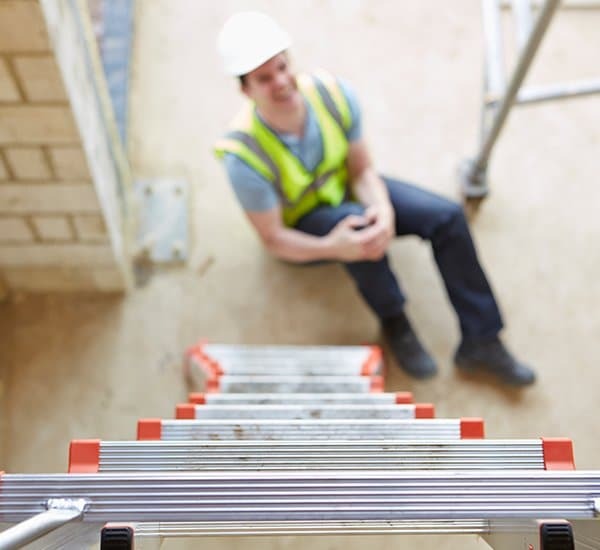 If you or a loved one sustained a serious injury from falling off a ladder, it’s essential to contact a New York construction accident attorney immediately. At Frekhtman & Associates, we conduct an independent investigation into the case, determine who is liable for your injuries, and demand fair compensation on your behalf. Here’s what you need to know about ladder accidents in New York – and when to contact an attorney. When you sustain any workplace injury, your first form of recourse will be a workers’ compensation claim. New York law requires all employers carry insurance that covers medical expenses and a portion of lost wages in the event of an accident. Offering these benefits also prohibits injured workers from suing their employers, even if they were negligent. Unfortunately, these workers’ compensation claims are not enough to fully reimburse you for the extent of your injuries and lost wages. Injured workers often struggle to make ends meet while living on a portion of their previous salary. The law does offer some recourse to injured workers in the event of third-party liability claims. If another party is even partially responsible for your injuries, you may be able to file a personal injury claim to compensate for lost wages and intangible losses like pain and suffering. Using a worn or broken ladder. Using a ladder with defective parts or footing. Failing to provide adequate fall protection on a construction site. Using a ladder in a small work area where it can’t fully open. A subcontractor placing a ladder on an uneven work surface or on construction debris that would make it unsteady. New York law requires that both general contractors and building owners take reasonable steps to assure a safe workplace for construction professionals on their property. When employers fail to do so, someone should hold them accountable. Your actions could not only help you recover compensation, it could mean you protecting someone else from the same fate. If you recently suffered harm in a ladder accident at a construction site, contact the attorneys at Frekhtman & Associates as soon as possible. We’re committed to hold companies accountable for their negligence, while gaining you compensation for your lost wages, pain, and suffering. Your next step is to review your legal options with our firm, risk-free. To schedule your free case evaluation, please contact us. OSHA regulations require among other things that ladders be placed on secure footing, that defective ladders be labeled “dangerous: do not use” and removed from work sites, and that ladders be secured or held in position to prevent tipping. There are also rules and regulations regarding frequent inspections of ladders and maintenance of ladders in good condition. Many construction companies ignore these rules or are unaware of the rules altogether.